I work as a piano teacher and music leader. I teach piano at beginner and intermediate levels. I incorporate classical and popular styles of playing in my classes. I also include basic improvisation; keeping lessons fun, fast paced and insightful. I deliver workshops that focus on creative ensembles, composition, social media and music technology. My workshops are bespoke; nearly always tailored to meet the needs of the client. I worked with year 5 students at St. James School Handsworth to write music inspired by the photography of Vanley Burke. We explored roots reggae music, and how different reggae ‘riddims’ were used for different functions including voicing injustice. School children wrote original lyrics and melodies inspired by Africa Liberation Day 1977. Holyhead School under the leadership of Sid Peacock and Toni Greham were our backing band, and rehearsed roots reggae riddims the children chose. Together I directed the performance for family and members of the public at the mac arts centre. I delivered social media and music workshops to year 6 primary school students based on the scalectrix project; together we blogged about the developments and composed original soundtracks for the racing day using music technology software. I worked with students at Hodge Hill to devise original pieces and develop ensemble work. Over 40 students subscribed to the session, (which was a pleasant surprise, as the following year there were only 10 participants, word of mouth from the previous cohort saw a massive jump in numbers). Young people created their own pieces using instruments and voice and developed performance skills. I worked with creative practitioner Chris Bishop to raise self-awareness in students at Paganel School. We explored the notion of home and identity as the school wanted the young people to learn about their community and its history. We worked with year 3 and 4 to support work leading to a performance at Weoley Castle during “Home week”. I lead sessions facilitating young people’s compositional skills using classroom percussion, songwriting. I also directed a live ensemble to accompany the songs and performance, which received great feedback from the school head teacher. As lead Artist I worked with three primary schools in Handsworth (St. James, Watville and Wilkes Green), facilitating creative ensemble music making working in partnership with teachers. Participants experienced live music performances in the City by each of the partner organisations and gave concerts of their own at some of Birmingham’s most internationally renowned venues. I was responsible for leading all three schools through performances at CBSO centre and Town Hall, I arranged, accompanied and directed participants, facilitating and supporting their music writing skills. I worked on a multi-arts project for young people who live in estates managed by Homes for Islington (aged between 13 – 19). Its aims were to develop creative arts skills and engage hard to reach young people. I led sessions on song-writing using music technology; I worked with a group of 14-18 years helping facilitate the creation of music tracks, lyrics and performance preparation. The youth centre manager noted a change in attitude and an increase in attendance to the centre during this time. The project culminated in a dance, visual arts and music performance piece at Sadler’s Wells Theatre March 2010. I worked as a music technology facilitator to deliver six half-day music technology workshops for 18 young carers between the ages of 11 and 17. Using the theme of Hopes, Dreams and Identity, the young people were encouraged to express their likes/dislikes, their views on the world and their hopes for the future. The music tracks were compiled onto a Young Carers Album, copies of which were presented to each of the participants. Dreams and Nightmares was a creative composition project for Year 5 students at Osmani primary school. Exploring a range of themes using dreams and nightmares as stimulus, participants created original compositions inspired by their own dreams, stories and artwork. I led sessions where year 5 students wrote songs, used classroom percussion and toys (suitable noisy toys from home) to create music that represented an element of their subliminal journey. We also used music technology to record sound bytes or words/phrases from their creative work onto an MP3 recorder. I was responsible for post production; piano accompanying and helping to direct the performance. I worked with 10 groups of young people who had profound learning difficulties including autism, physical disabilities, speech impediments and hearing impediments. We worked together to write original songs based on national curriculum subjects/topics studied that term and developed team building skills. As part of Spitalfields Music’s playing fields project the City of London Sinfonia joined forces with pupils from Halley Primary School to perform their own original compositions alongside well-known orchestral works including Bartok’s Rumanian Dances. I worked with a team of animateurs to help participants devise songs, as well as composing and arranging a song for the school and chamber orchestra. One of my biggest achievements was writing an orchestral score which received a great reception from performers and audience. I worked as one of 3 lead artists on an exciting intergenerational music and heritage project, where I worked with the elderly (from a local residential home) and primary school students. We worked to devise new music and lyrical ideas inspired by the heritage of Castle Vale – a recently regenerated area. The stimulus for the project was oral history, using interviews and dialogue and turning them into melodic and rhythmic ideas for our final piece. I played piano for the final performance and prepared participants for performance. I worked with students at Hodge Hill School to compose original songs performed at the CBSO centre. I was also a support artist for their big band sessions. I worked as an adult mentor at College High School in Great Barr Birmingham. I was responsible for providing support and guidance to a group of teenage mentees. I also facilitated the development of their music skills including music technology and songwriting skills. I also worked as a music mentor in a youth inclusion project, in Shard End, working with kids with severe behavioural issues, again using music mentoring to reassess life choices. I worked as a trainee artist on a project based upon the organ in Coventry Cathedral. We used technology in fun, innovative ways to inspire children and young people to explore music, the arts and their own imagination! We recorded organ and other quirky sounds collected from Coventry cathedral and modified them to make a soundtrack. I worked with orchestral member Mark Goodchild from City of Birmingham Symphony Orchestra as lead artist on a creative project based on Holst’s ‘The Planets’. “Gifted and Talented” music and English students wrote and performed 5 original planet themed compositions. I worked with students at Hamstead Hall School to create an ensemble that composed original songs to be performed at the CBSO centre. I was also a support musician for the Birmingham Jazz Youth Sessions; advising and supporting young people with their playing, tuning, warming up etc. I worked as an adult mentor to help 6 young people at risk of anti-social behaviour to develop their social skills through one to one mentoring. I also prepared them for peer mentoring. I used music technology, music theory and performance skills to help young people improve their behaviour in school and home with excellent results, teachers noted behavioural changes in classroom and allowed a student to participate on an away trip for the first time in 2 years. As project manager, I worked with young people in care to develop confidence, self-esteem and to learn how to compose their own music using Garageband. Young people created tracks in just two morning and were proud of the quality of their work. I worked with 3 groups of year nine students with varying spectrums of autism to create beats and improve songwriting skills using Garageband and Reason music software. I worked as a part of a group of 3 lead artists leading a group of 14-18 year olds in Handsworth to create a new work for Gigbeth festival. We used Garageband and practical activities to help participants with their songwriting and performance skills. I was project manager and one of four music leaders in ‘Bass Culture’ music project which gave participants a broad historical journey of black and urban music. The workshops were interactive and practical. Participants had the opportunity to develop compositional skills using a variety of practices such as MIDI, notation, improvisation and music software packages. I led sessions using technology and improvised funk jams on instruments exploring scale and chord patterns. I project-managed a 2 week music project at 610 Centre with 2 other music practitioners to lead workshops on black and urban music styles. We composed original songs as a rock band and used Reason and Logic Pro music software for speed garage and hip-hop compositions. I worked with “Gifted and Talented” students to help encourage them to study music at GCSE level. We developed music and creativity skills through use of music technology, composition and performance. The head of music noted an increase in confidence for students that positively effected their music studies and performance. At that time, the school did not have a music teacher, so I helped to teach Key Stage 3 music concepts through workshops/lessons each week. I taught year 8 and 9 students the relevance of music in media and about form and structure through song writing. I worked with my old primary school to help teach Key Stage 2 music students exploring and developing listening skills, coordination, controlling sounds through singing and playing, creating and developing musical ideas through composition. I worked with a group of 15 participants to facilitate their compositional skills by simply using everyday items. We used cardboard, cereal packets, bottles and items in the room to make original compositions. The group learned about basic note values and how to notate them using a graphic notation chart I created. Participants were encouraged to explore the different textures and sounds of their instruments. The workshop ended with a group performance. I facilitated a collaborative workshop with a team of 4 community artists to engage learners with the principals of the water cycle – a Keystage 2 topic. After recapping on the basic principals of evaporation, condensation, precipitation and collection we split into small groups, and I led a music improvisation exercise. Participants were encouraged to depict the 4 main elements of the water cycle through sound. Using a simple graphic notation chart participants wrote down symbols as a loose reminder for their improvised parts. Through sound participants investigated the sounds, textures and images with noises made from their bodies. The project ended with a performance of their improvisation in front of the group. 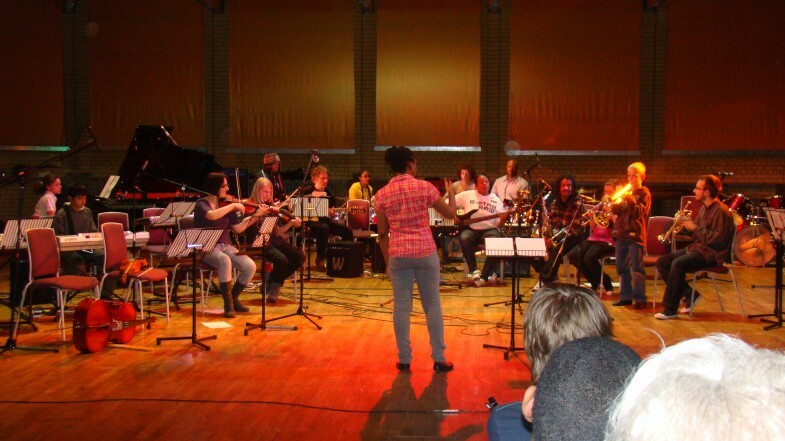 My first job as a community musician entailed working on three-day project working with 12 young people from Birmingham. We were one of the first groups to use the new music technology suite at Symphony Hall. I led songwriting sessions with 5-7 year olds creating original music and lyrics.